Sweeping across eastern Turkey, we'll learn a Kurdish folk dance, see a Silk Road palace, watch a little oil wrestling, visit the 4,000-year-old hometown of Abraham, ponder a megalomaniac king's attempt to join the gods…and hangout with nomadic Kurds. Hi. I’m Rick Steves venturing beyond Europe this time to bring you more travel thrills than ever. We’re in eastern Turkey. Sweeping across eastern Turkey, we’ll learn a Kurdish folk dance, see a Silk Road palace, watch a little oil wrestling, visit the 4,000 year old home town of Abraham, ponder a megalomaniac king’s attempt to join the gods... and hangout with nomadic Kurds. Turkey bridges Europe and Asia, both geographically and culturally. Beginning in the Far East near Erzurum, we cruise to where Noah docked — on Mount Ararat, travel to Lake Van, Diyarbakır, Harran, and finish atop Mount Nemrut. Most tourists hit the west of Turkey. But Turkey’s a vast land. It’s bigger than Texas, with a population of 60 million. It’s a cultural baklava, richly layered with history and people. While for most tourists the east of Turkey is just a vast spot on their map, a visit here paints a vivid — if complicated — human face on this part of your globe. Most people in this part of Turkey live in simple rural villages. Families go about daily life as they have for generations. Meli: Hey, Rick! This is really great Rick, you have to see this. This is a saz. People play this whenever they get together. They’ve been doing it for 4,000 years, since the time of the Hittites. As before, I’m teaming up with my friend and fellow tour guide Mehlika Seval. 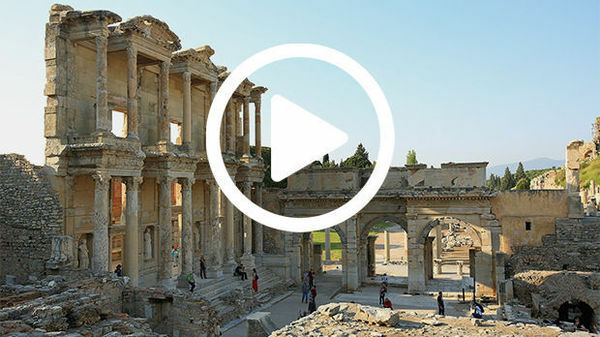 Meli leads tours for me through Turkey, but we’ve kept some time open to make this program. When I first visited eastern Turkey, most villages didn’t have electricity. Today, even with TVs and satellite dishes, remote villages like Cayirbag maintain their traditional hay, duck, and dung economies. It’s late August and winter preparations are under way. Stacks of hay — cone-shaped so the snow falls off — are reminders of the harsh bitter winters. The hay provides both food for the animals and insulation. And hay is even twisted into rope to bundle...more hay. Using all available resources is a part of life here. Cow pies provide vital fuel. People from lands with lots of trees are often unaware of the importance of dried cow dung. It provides fuel in a land where wood is scarce. That’s why many poor countries take such good care of their cows. Meli: So for all the fuel they need all they need is two cows. That’s it. They have it for the whole day. Rick: An entire family’s needs? Meli: An entire family’s fuel needs. Erzurum has long been a leading city in eastern Turkey. Meli: If they haven’t been to France they do. Erzurum has always been a garrison town. For 1,500 years, this fortress has stood like a breakwater, taking wave after wave of armies from the East. One of which was the ethnic Turks. They arrived in Anatolia — as the land Turkey occupies is called — in the 12th century. The fortress is now a civic center. And today the only battles fought are between wrestlers. Things start with an oily warm-up. Wrestling is considered the universal combat sport, and Turks — they’re among the finest wrestlers in the world. Meli: This kind of wrestling came with the Turks from Central Asia 800 years ago. They’re touching earth, symbolizing we come from earth, we go to earth that’s where we get our energy, they are receiving the energy. Rick: So everybody is in here right now. Meli: Yeah, wrestling is a kind of entertainment. So it starts with everyone of different age groups and then they end up with the best of each age group. Rick: So this is called “oiled wrestling”? Meli: Not just oiled wrestling, it’s called oiled grass wrestling, grass being reminiscent of Central Asian plains. Meli: This is really fun. Turkey’s wrestling is entertainment. Just as Turkish wrestling came from Central Asia so did other aspects of Turkic culture. This tiled minaret has a sister in the city of Samarkand, far to the east in Uzbekistan. Today, instead of being influenced by the East, Turkey’s cultural influence is outward. Turkic nations from the former USSR —Uzbekistan, Kazakstan, Turkmenistan, and so on— stretch all the way to the Great Wall of China. Now, with the fall of the Soviet Union the people, over 100 million, look to Turkey for cultural leadership. 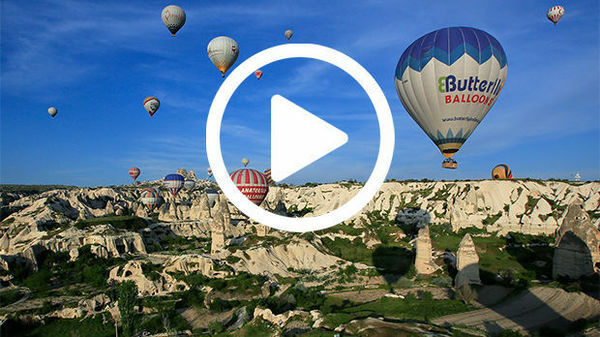 And with a Voice of America–type agenda, Turkey broadcasts cultural news to this vast region. A common denominator for these people is Islam. Eight hundred years ago — a generation after they arrived — the Turks built the Ulu Cami mosque. Rick: So every Muslim is supposed to make a pilgrimage to Mecca? And we’ve got a lot of traveling yet to do. Eastern Turkey is a vast, high plateau. Erzurum is at about 6,000 feet and towering even higher dominating this corner of Turkey is Mt. Ararat. Many people — Christians, Jews, and Muslims — know Mount Ararat from the flood story. It’s in the Bible, the Torah, and the Koran. Each says that God sent 40 days of rain to rid the world of corruption. Noah, with his animal-filled arc ready to start things over, landed here. Ararat stands where Armenia, Iran, and Turkey come together — it’s almost as if they pushed it up. At about 17,000 feet, it’s by far the highest mountain in the region. The next stop on this road is the border of Iran. This was the Silk Road — Marco Polo may have crossed this 12th-century bridge. Camel caravans laden with silk and spices brought the riches of the East into the West. Whoever controlled this valley controlled the trade. Even today, it’s the scene of modern caravans carrying, not silk but farm goods, textiles, and lots of oil. And this is one nuisance Marco Polo never dealt with... the Iranian-Turkish border. With control of trade came wealth. The İshak Paşa Palace, built in the 17th century by an Ottoman general, overlooks this strategic thoroughfare of civilizations. The mix of architectural styles reflects the centuries-long parade of traders that together have made the complex ethnic mix of Anatolia: Selçuk, Ottoman, Persian, and Armenian are all cultures that have left their mark throughout this vast region at various times. To see the remains of one of these cultures, we’re driving to Lake Van. Lake Van is vast...almost a sea. The water has a high sodium carbonate content. You can do your laundry here without soap...or clean a little raw wool. The water feels silky. Ferries shuttle visitors to Akdamar Island. There’s so little tourism in the area that we have the boat to ourselves. This region is littered with reminders of a refined Armenian culture — now gone. Of the great Armenian churches, perhaps the most beautiful is out here, on the island. The Church of the Holy Cross dates from 921 A.D. After an Arab invasion, an Armenian prince took refuge on the island. While the church he built is quite ruined, some of its art — as well as its acoustics — survive. The outside is decorated with fine reliefs — scenes from the Bible. Here’s Jonah being swallowed by the whale. A thousand years ago, sculptors around here didn’t know what a whale looked like, so they carved a big fish with a pig’s head. Here’s David with his sling preparing to fell Goliath and here is Jesus pocked with bullet holes, reminders of conflicts this church has witnessed over the centuries. A tragic conflict around 1915 led to the destruction of the Armenian culture in this part of Turkey. While this region’s many ethnic groups have suffered more than their share of grief, the plight of the Armenian community has left a black mark on modern Turkish history. While Turks and Armenians debate the facts, sights like this remind me of a once-thriving Armenian community. Here in the east you’ll find almost no traffic, but drivers are advised to stay off the roads after dark. Police and military checks are routine. Distances are great and — with so many scenic distractions — drives take longer than the map indicates. Allow time for photo ops and bouncy rest stops. Meli: Rick, do we have to do it? Rick: Who’s doing this? Alright. Wherever you stop you’re never far from a glass of refreshing tea. Travel in Turkey is a package deal. And it can be rough travel — like this. Many Westerners call these porcelain footprints “Turkish toilets,” but they’re the norm in most of the world. In fact people in many parts of the world find sit-down toilets we might consider “normal” just as shocking as my first encounter with a toilet like that. Eastern Turkey is ideal for admiring the timeless art of living with the seasons. The nomadic lifestyle is an ancient one around here. Families and their animals used to roam freely but modern times threaten the nomadic ways. Meli is taking us to meet some Kurdish shepherds content to live the ways of their forefathers. It’s cool under the goat-hair tent. Rick: So how many families are here together with this group? Meli: They have rented this place so they’ve been here for one year. That’s not the traditional nomad life. They used to be able to just take off and go and land wherever they wanted. The conversation is filled with passionate opinions that inevitably center on complex Turkish politics. I left feeling confident that these proud people will continue finding ways to live in a changing world. Kurdish culture remains a vibrant part of Turkey’s ethnic terrain. Meli — a tour guide who can move mountains for a Kodak moment — has arranged for a group of Kurdish dancers to join us for a musical picnic. These students were raised knowing folk dances not for touristic stage shows, but to keep their traditional culture alive. There are 10 million Kurdish people in Turkey but only in the southeast are they a majority. While many want their own country, most — while wanting to deal with their problems — are content to be Kurdish Turks. Turkish has two meanings: political and ethnic. Just as you’ll find Polish and Norwegian Americans, you can find Armenian and Kurdish Turks. Modern Turkey was born in 1923 and, according to the constitution, anyone who lives here is welcome to consider themselves politically, Turkish. This 1,200-year-old bridge crosses the famed Tigris River. It leads to the walled city of Diyarbakır — the main city of southeast Turkey. Growing up at a crossroads, Diyarbakır has hosted Assyrians, Persians, Alexander the Great... Romans, Arabs, and Turks. Today, most of its population is Kurdish. Diyarbakır is swollen with nomads and villagers who — feeling unsafe in the disputed hills — have moved in to wait out the troubles. Highly skilled in the country, they’re struggling in the city. While there’s virtually no tourism, there’s plenty of entrepreneurial activity. Rick: Hi, I’ll take one, there you go. Teşekkür. The courtyard of the mosque is a cool refuge for those awaiting the call to prayer — or the stray tourist needing a break from the intensity of the city. In most eastern cities, I opt for the top-end hotel. About the price of a simple hotel in Europe, it affords a refuge with the necessary comforts to keep me healthy and well rested. Throughout Turkey, from the humble B&Bs to the fanciest business hotels, breakfasts are predictable: you’ve got olives, white cheese, tomatoes, cucumber, hard-boiled eggs, watermelon, fresh bread, and — my favorite — yogurt with honey. And to drink? Tea or coffee and some terrible instant orange drink. We’re heading south — toward the Syrian border. Ethnic struggles and refugees are nothing new to this land. In fact, 4,000 years ago, Abraham and his followers walked these plains searching for a homeland. According to the Bible, Abraham settled here...in Harran on his way to the promised land in Canaan — that’s Israel, about 300 miles to the south. That was about 1900 B.C. Harran is one of the oldest continuously inhabited places on earth. These conical houses worked well in Abraham’s day…and they still do. The conical shape keeps the interior cool — and the baby comfortable — even though it’s well over 100 degrees outside. Centuries of wind and warriors have rounded the corners of Harrans’ fortress. But, it seems the people and their ways of life have changed little. Turkey’s cultural diversity shows itself in subtle ways. For instance, ethnic groups tie their headscarves differently. Meli: The women of the Black Sea cover their head this way. In central Anatolia the woman choose another style. And my friend, Naima, an Arab Turk, covers her head this way. Harran’s women wear scarfs both for modesty and for protection from the dry heat and blowing sand. This arid region has been short of water since Abraham’s time. But today irrigation canals are bringing smiles and new life to the area. With the help of the largest irrigation project of Turkish history, the area anticipates a boom time. Formerly parched land is becoming lush. As incomes are expected to skyrocket, local men will no longer dream of going abroad for a good paycheck. This is the Atatürk Dam. It’s the biggest of 22 dams in the Southeast Anatolian Project. This is big news for Turkey. It’ll generate one fifth of the country’s electrical needs, it will provide water to irrigate one fifth of its arable land, and it will help employ 10 million people. One of the great treats for any visitor to eastern Turkey is a trip to the royal tomb crowning Mount Nemrut. A road takes us to within a short hike of its 7,000-foot summit. This mountain is a study in megalomania. The top 150 feet is actually a man-made pile of slave-crushed rock, decorated by huge statues of the gods and King Antiochus. About the time of Christ, Antiochus ruled a small state between huge empires in the East and West. Artfully keeping East and West happy is how he survived politically, and he went to his grave using the same tactics. For instance, this statue represents two gods: the Greek god Zeus — here we see Greek facial features and beard — and the Persian god Ahura Mazda, with eastern headgear. With an impressive twist of theology, Antiochus figured if he built his mountaintop tomb surrounded by statues of himself with the gods, he’d join that divine inner circle. And for 2,000 years, he’s been here with Hercules, Apollo, and the gang watching silently over the stubborn vastness of Anatolia. Thanks for joining us. Meli and I hope you’ve enjoyed our look at eastern Turkey. And I’ll see you next time for more travel thrills. Until then, I’m Rick Steves. Keep on travelin’.